Today would have been my Grandpa’s 82nd birthday. Every year at the beginning of December, he threw himself a birthday party. When we were little, my family usually went out to a restaurant and then met back at the house after the meal for visiting and birthday cake. The evening always capped off with us driving around to look at the newly hung Christmas lights in our neighborhood before we went home for the night. As we got older, we started to order in and most years the meal was Chinese food, Grandpa’s favorite. He always bought wine and passed out chocolates. He loved getting everyone together and it became a tradition that everyone in our family looked forward to. This is our first December without Grandpa and as it comes closer and closer it feels even harder to believe that he won’t be here. Because I don’t live in my hometown and Grandpa was in the hospital for so many months before he died, it is easy enough to feel like he might still be in the hospital and coming home one day. I am not always so aware of the reality until I notice the subtleties; his toiletries missing from the bathroom counter or the stack of Bargain Hunters that always sat on the table that isn’t there anymore. Grief is always evolving for me. All of the sadness and hurt and disbelief have been overpowered by guilt as of late. Guilt because last year I missed his birthday party. The weather was bad and we didn’t come and I feel that hanging over my head this year. How could we have known it would be the last? Who could ever know? I have guilt because two weeks or so before he died I was visiting friends in a city near my hometown and debated driving up to see him for an hour or so but for some stupid, probably selfish reason decided against it. But then he died. And ever since I’ve been torturing myself with what might have been. What would we have talked about that visit? The last time I saw my Grandpa alive I told him I loved him and I told him I’d see him soon. Because I really believed that. But when I got to the door to leave, I turned back to look at him in his hospital bed, and he lay there silently, staring at me so sadly, as if he was trying to memorize me. I know now that he knew that it was the last time he would ever see me again, at least in this life. But then, I couldn’t believe that. I couldn’t accept it. I acted cheerfully and positively for him because I wanted him to know I believed he could fight back. I wanted him to know how much I wanted him here. But now I have regrets over not visiting that extra day. My life will hopefully be long and the thought of missing someone as much as I miss him for the rest of it is overwhelming. I feel guilty because I haven’t visited his grave. I go home often and every time, I tell myself that this will be the visit but I just can’t bring myself to go. My stomach sinks at the thought of it and when we so much as drive near the cemetery, I panic. I don’t want to visit my Grandpa at his grave. I want him to hug me when I walk up the stairs of his house. I want to eat supper with him at the kitchen table. If I see his grave that makes it real and I can’t face it yet. But I feel guilty because I wonder if he would think that I’m not going because I don’t care. Would he think I don’t miss him? I think about him every day, but maybe that’s not enough. The interesting thing about losing someone close to you is that it connects you to people in a different way than you were before. When I used to hear of someone’s relative dying, or their pet or their friend, I felt sympathetic of course, but I could not relate. Now, my chest instantly becomes heavy; my nose burns, my throat chokes up. I feel my grief while I feel theirs. I recognize the familiar sadness in their eyes and I commiserate with them immediately, like being a member of a club no one wants to be a part of. This experience has given me new compassion for people that I did not have before simply because I did not understand and I think in some ways that is beautiful. My family has grown stronger from this loss and our relationships are closer. We make even more time for family time. We appreciate each other more, I think. We are more sensitive to each other and more open about showing our love. We are Grandpa’s legacy and we take that seriously. One of my cousins is expecting the first great-grandchild this Spring and as sad as I am that Grandpa isn’t here for it, I know that he is, all at the same time. On the first Saturday of December this year, we gathered with Grandma at the house. We ordered in Chinese food and we drank strawberry wine. I made a Turtle Cake for the party because Grandpa loved chocolate and often passed out Turtles this time of year. We played board games and laughed a lot. It wasn’t the same of course; how could it be? But we celebrated him, which is all we can really do. Happy birthday, Grandpa! I miss you today and every day. Preheat your oven to 350 degrees. Grease and flour three 9 inch round cake pans and line the bottoms with parchment. Set aside. Mix dry ingredients in the bowl of your stand mixer. Whisk the wet ingredients together in a separate bowl. Pour the wet ingredients in with the dry and beat on medium speed for 2 minutes or so. Scrape the bowl down and beat for another minute until well blended. Pour batter into prepared cake pans and bake for 30 minutes, rotating pans halfway through baking, until toothpick inserted in the middle comes out clean. When done, take cakes out of the oven and cool for about a half hour. Remove from pans and cool on wire rack for another half hour. At this point I like to wrap each cake in plastic wrap and store them in the freezer until ready to assemble. Keeping the cake cold helps the filling and ganache to set. In a small saucepan over low heat, melt together the unwrapped caramels and the cream. Once totally melted and smooth, remove from heat. Lay one of your cake layers down on a cake plate. Pour half the caramel mixture on the cake, letting it run down off the sides. Sprinkle with half the chopped pecans. 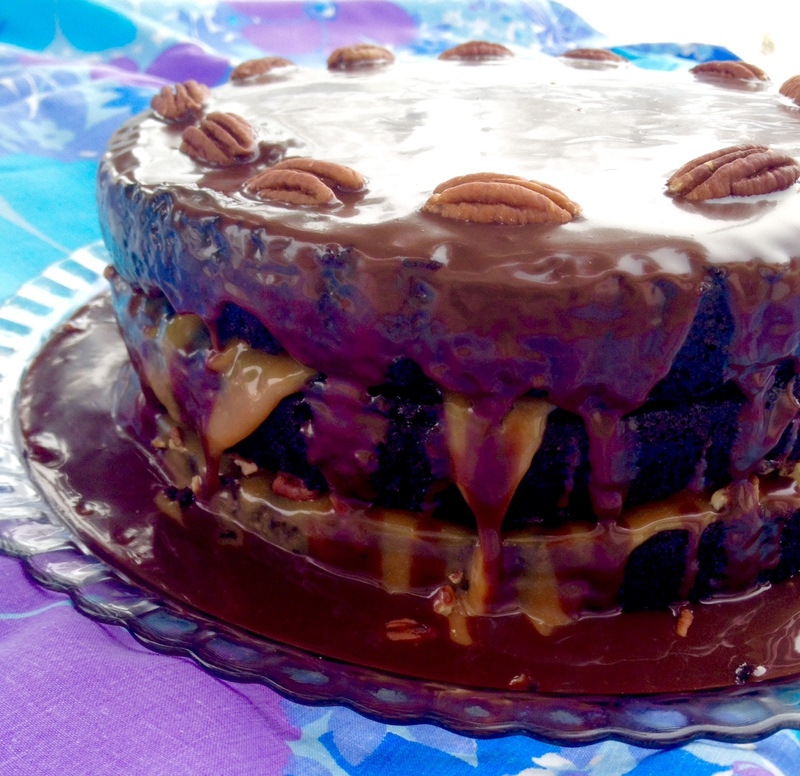 Lay the second cake layer down and top with the remaining caramel. Sprinkle with the other half of the chopped pecans. Lay the third cake layer on top. Put ½ cup heavy cream in the same small saucepan over low heat. Pour chocolate chips into a medium bowl. Once the cream starts to bubble, pour over the chocolate chips. Let sit for two minutes, then whisk together until a thick chocolate sauce forms. Stir in the pinch of salt. Let stand for a few minutes until it cools and thickens to a pourable consistency. Pour over the top of the cake, letting some drip down the sides. 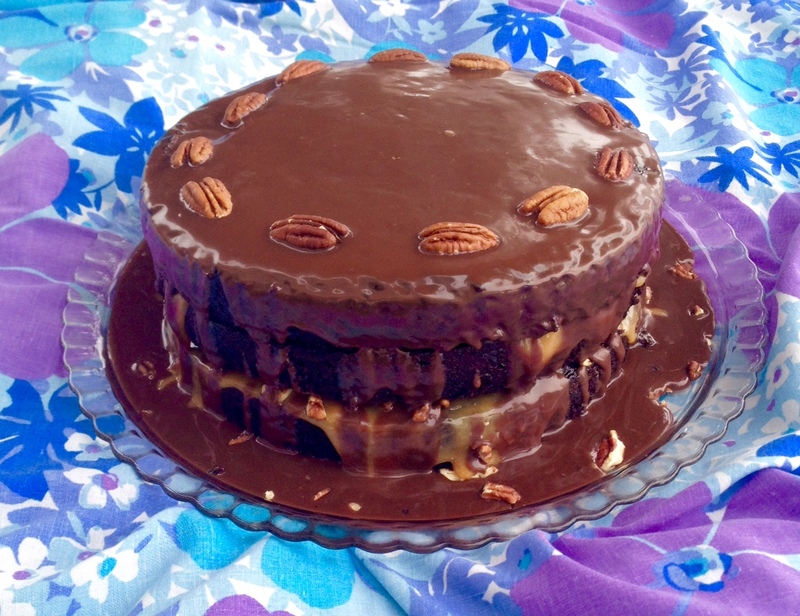 Garnish the top of the cake with pecan halves. Store cake in the fridge and pull out 30 minutes or so before serving.